“ I found your service to be an excellent help throughout the procedure of obtaining my pension, very professional and kept me up to date. Very happy with the result and many thanks. “ Many thanks for your efficient help in this matter. I was all "at sea" before contacting you and my provider seemed less than helpful when dealing direct. “ I have been more than pleased at the prompt service I have received. Any queries I had were answered positively and promptly. I would certainly recommend you to any friend requiring advice. What is a flexible drawdown plan? Flexible income drawdown is an alternative to buying a lifetime annuity since April 2015 as you can now take benefits from your pension for anyone aged 55 years more. These plans are also known as pension drawdown, income drawdown or now as flexi-access drawdown. In particular for funds larger than £30,000 it will be possible to take the full fund as cash less tax at your marginal rate. This allows you to take your tax free lump sum and and leave the remaining fund which you can access easily as an income or single payments. There is no limit to the amount you can take other than the level of tax you would pay. If you have a capped drawdown plan you are still limited to 150% GAD (government actuaries department) or about 50% more than an annuity. It is ideally suited for those that would like to avoid buying an annuity with the opportunity to leave the fund to a dependant, nominee or successor on the death, possibly free from tax or marginal rate of tax in most cases from 2016/17 tax year. Leave the fund in a secure cash fund or select a smoothed growth fund with a 5% to 6% return and low volatility. Flexi-access drawdown allows an individual to take an unlimited level of income from the plan. Although you can contribute to a pension you are limited to £10,000 each year with tax relief. Capped drawdown is limited to 150% GAD and is no longer available but all existing plans can continue. You can also contribute to the pension in the same tax year, especially useful if you are still working and can benefit from tax relief as the allowance is £40,000 each year. The income can be taken monthly, quarterly, half yearly, annually or ad hoc as single withdrawal as and when required. Funds in flexible income drawdown can be invested in different ways such as cash, smoothed growth or fully invested and this depends on your attitude to risk and the time period you intend to leave the funds in drawdown. Cash is low risk and currently produces low interest of about 0.5% per year, smoothed growth is defensive offering 4.0% per year which is added daily and fully invested is volatile falling and increasing daily but with higher potential returns of 4-5% per year. Investment volatility in retirement makes it difficult to take a regular income as sometimes the fund value is low and you need to cash-in more units to pay the same income. Therefore low volatility in funds reduces this risk and it is possible to achieve low volatility and higher returns than cash by using a smoothed growth fund. The low volatility of the protected growth fund would offer is due to the funds expected growth rate being added daily to your fund. This produces a smoothed return and more certainty that income can be taken without the same volatility as an invested equity portfolio and better return than a cash fund. This is particularly the case where the time frame for the drawdown is short, say two or three years. The annual rates shown above are based on a purchase price of £100,000 and should be used as a guide only. 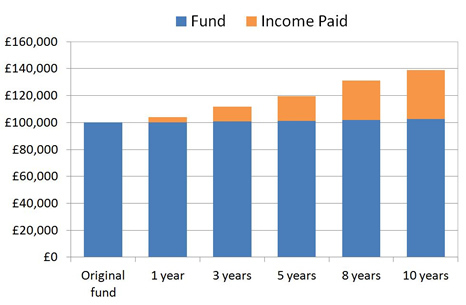 Pension drawdown assumes a 4.0% fund growth after charges. Pension drawdown is a higher risk pension than annuities and not suitable for everyone. For a drawdown rate specific to your circumstances you should complete the flex-access drawdown quote. As you can see from the table the income figure for flex-access drawdown at ages 55 is £4,800, whereas at age 75, this has risen to £6,600. This is the maximum amount that can be taken out of the fund where the objective is to deplete the fund assuming the surviving partner lives to 97 years of age. Flexible drawdown access offers a low risk sterling based cash fund or low to medium risk smoothed growth fund. Depending on your attitude to risk and the level of risk you are happy to take will determine the size of fund you can have in the future. As an example, a 60 year with a fund of £133,333.34 could take a tax free lump sum now leaving £100,000 for drawdown. An income can be taken from £Nil with no maximum and this compares to a lifetime annuity of £3,640 pa based on a 100% joint life payable monthly in advance. Drawdown access allows the fund to be placed in cash, smoothed growth or equity funds. To reduce risk but achieve growth a smoothed growth fund should be considered. The following shows a smoothed growth fund taking an income of £3,640 pa to match the annuity over different durations from 1 year to 10 years. The growth after charges is 4.0% per year which is added the the fund on a daily basis providing a very low level of volatility for a growth fund. To take the whole fund as cash would mean paying higher rate tax and in most cases people would be willing to pay only basic rate tax. This would mean taking the fund over several tax years and for those people that would classify themselves as low-medium risk investors could consider a smoothed fund. 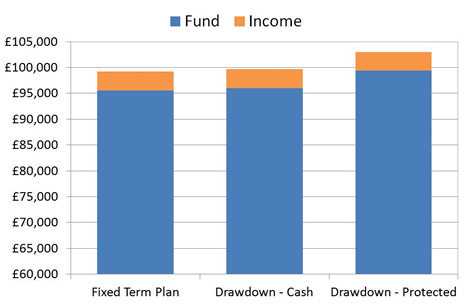 The following chart compares a short term of one year for the fixed term plan with drawdown in a cash fund and smoothed growth fund. All options in this example provide an income of £3,640 pa and after set-up charges the fixed term plan returns the fund and income of £99,200. The drawdown cash fund returns the fund and income of £99,670 and the drawdown smoothed growth could potentially return the fund plus the income of £103,020.